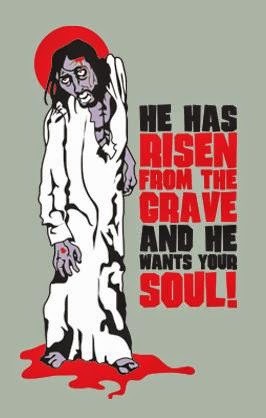 Normally, I try my best to ignore Easter, or Zombie Rabbi Day. This requires staying out of shops that have seasonal aisles piled high with sugar and chemical-laden treats and garish plastic crap from China that cause little children to have cataclysmic meltdowns when their parents don't buy the stuff. I also overlook the signs in neighbors' yards advertising their churches' annual come-to-Jesus "free" Easter egg hunt and proselytizing fest. And thick glossy sale ads in the Sunday paper exhorting us to buy a new set of clothes ('cause Jesus cares about what's on-trend for Spring!). And a myriad of other mostly small annoyances. Soon it will be over. Sigh of relief. But there's one irritation I can't ignore. She's 87 years old, has a heart condition, and she's my mother. Did I mention she's been a Christian all her life? When I was little she could force me to go to church. As a teen, I quickly put an end to that charade. When I was a young adult, I went through a crisis and went back to the church to try to find answers. (Another long story, told elsewhere.) Needless to say, church and Christianity were not the right answers and I completely disavowed them. My brother, who is about 2 years younger, also is not a Christian. Mom knows this about us and seldom tries to engage us because we can easily shut her down. Another fact about my mom - she's not the brightest tiara in the jewelry box. I know I need to treat her with respect. It's the right thing to do. However, in a recent phone conversation, she asked me how I was celebrating Easter. I told her my husband, daughter and I were not observing Easter at all. She protested, "But it's a religious holiday!" I calmly explained that people have different religions, and some have none at all. This only caused her to ramp up the indignation. She pulled the "I'm not long for this world" card, and then went on to say that she needed to have a serious talk with me and my brother about accepting Jesus Christ as our savior. She pulled the "I'm not long for this world" card, and then went on to say that she needed to have a serious talk with me and my brother about accepting Jesus Christ as our savior.I'm so glad that I hadn't just taken a sip of beer, because it would have come out my nose and that's unpleasant. I don't remember what my reply was - something along the lines that I was not interested and she shouldn't waste her time. Then we talked about other subjects and hung up. She's not done, and won't take "no" for an answer. This little old frail woman has been convinced her whole life to be utterly terrified of what will happen to her when she dies. By extension, she fears her children will also go to the Christian hell. No amount of explaining to her that it's a myth, that there's no such place, will make her let go. She doesn't have the intellectual capacity to fathom the true history behind the creation of religions. I could just lie and say, "Sure, Mom, Jesus is my huckleberry" so she'll leave me alone, but then she'll want to talk about Jesus all the time and I find this unacceptable for two reasons: 1) I want to be true to myself and 2) I am so sick of hearing about Jesus that I just want to go bite a tire. A friend who's dealt with the same thing suggested that I tell her religion is a very personal and private matter that I don't discuss. I'm not sure Mom will go for this. Recognizing boundaries has never been one of her strengths. My tactic up until now has been just to change the subject. But she's nearing the end of her life and I can tell "salvation" is becoming a more urgent matter to her. She will continue to press it and she knows exactly how to push my buttons. I want to be as kind to her as possible while she's dealing with mortality, but I also don't want to pretend to be something I'm not. Suggestions, ex-Christian friends? Don't Be Stupid... You Know You're Wrong?! Does the Bible Prove Itself?